Disclosure: I was given a complimentary ebook copy of this product by The Old Schoolhouse Magazine through the Schoolhouse Review Crew, in exchange for an honest review. 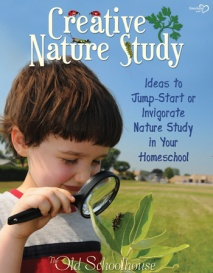 Creative Nature Study is a wonderful book full of ideas to help homeschool families discover the nature and beauty God created. It is almost 100 pages of not only ways to see the glory God made, but also has resources to specific links to learn more about nature. There is a list of books given to supplement the study, and also some products available directly from The Old Schoolhouse. There are ideas for projects to make and instructions on how to have a nature study. My sons loved filling out these scavenger hunt pages. My sons and I had so much fun utilizing this book to gain ideas into creating the ultimate scavenger hunt. There are 18 scavenger hunt pages included in the back of the book and I printed out all of the pages. They are colorful and would be fun to take along on the hunt or complete after getting home, which is what we did. We were on the lookout for insects, leaves, birds, butterflies, clouds, and spiders from the worksheets included. These sheets would also make amazing notebooking pages for homeschool studies for older children. The boys noticed there were some trees that were the same, but they were different in size. We observed the uniqueness of the leaves, and how they were different shapes and colors. They also found a bee, ant, spider, and a surprise visitor at the playground: a lizard! We saw the beautiful sky and I was inspired after reading this book, to ask them some questions. I asked them what did they see that God created and did they remember what day of Creation that was on. 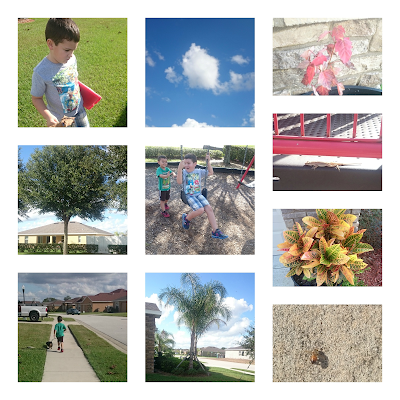 The scavenger hunt was a success and we got home to document all that we had seen. It is still relatively warm for November where we live, so this was a splendid way to get outside and enjoy the beautiful weather. This would make an extraordinary science unit study for anytime of the year, depending on location but probably would be best in spring and autumn when things are changing. It can also be adapted to incorporate all of the members of the family. There were so many incredible ideas in this book, that I would have never even thought of. It gives places to visit and what to do there, and what to pack. My favorite was having a section dedicated to children with allergies. Every spring, my oldest has the worst time with his allergies so that really hit close to home for me. There's advice in here from real homeschool Moms who have been there, and I thought it was remarkable that they all share this information in this book. I would definitely recommend using this in homeschool studies, as it was very enjoyable to get outside full of ideas in all of the splendor God created. It is fantastic that this product emphasizes all that the Lord has blessed us with. I strongly support this company because of their beliefs and outstanding products. Thank you for stopping by to read my review. If you would like more information on this study, please click here. sounds very intriguing. What age do you think it is best for? My boys would love the scavenger hunt pages as well. Great review- welcome to the Crew! Great job on the review. Scavenger hunts are always so much fun :) Welcome to the Crew!! Sounds like a great book and I enjoyed reading your review. Very cool to learn that you are joining the Crew! Welcome! Looks like a wonderful book. Thanks for sharing with #WhatToReadWedneday. Looking forward to more posts from you next week. Thanks for sharing another great STEM tool!